With good will and warm care to enjoy the special moment, every member of Chinese people prepare themselves for 12 months just for the special day coming- it is spring new year, which we not only send our best wishes for the year beginning but also meet much more family and friends who may be busy outside all the year. 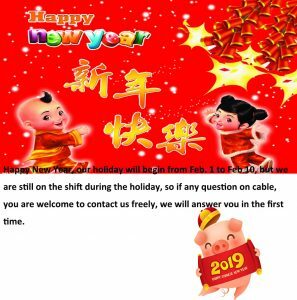 our office would close from Feb 1 to Feb. 10.
during which we are still on service for yours cable and wire inquiry, so anything we can help, welcome to contact us freely, will reply you in the first time. thanks.